Chincoteague is for lovers of…Adventure! You could spend more than a week experiencing the adventurous side of Chincoteague and Assateague islands, but here’s a long-weekend’s worth of ideas to get you started on your Spring, Summer, or Fall vacation. Friday PM: Leave work early, hit the road, and arrive in Chincoteague before it gets too dark. 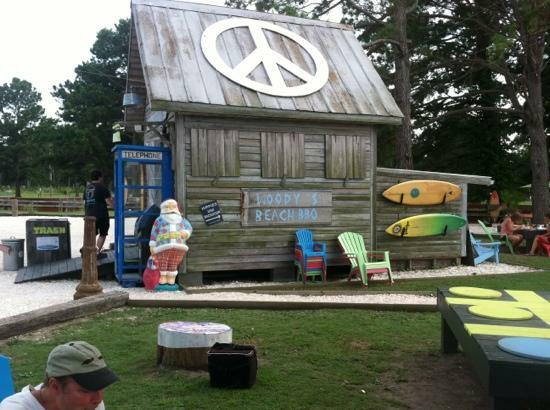 Grab some great BBQ and a few games of tic-tac-toe at Woody’s Beach BBQ, within walking distance of the Refuge Inn. Get to bed early because tomorrow is an early morning! Saturday: Grab breakfast & sunscreen at the hotel and then rent bikes from the Bike Depot, right next door. You get free admission to Assateague on foot or on bicycle. Do one loop of sightseeing around Chincoteague National Wildlife Refuge’s Wildlife Loop, and then do a timed race the second time around. Return your bikes and grab some lunch, then head out on a jetski or stand up paddleboarding excursion with CI H2O. Take lessons or venture out on your own to explore the marshes of Chincoteague Island in our sweet, salty water. Afterward, it’s back to the hotel for showers and then off to the carnival grounds for Clam & Oyster Fritters, hamburgers, pizza, French fries, caramel corn, bingo, and rides. Support the local volunteer Fire Department by playing games, riding the tilt-a-whirl and scrambler about 20 times each, and don’t forget to wait in line at least once to ride everyone’s favorite ride, the Paratrooper. This is a great opportunity for kids & parents to get some time apart and then call each other “to the flagpole” over the loudspeaker when kids need more money or when mom & dad are ready to head back to the hotel. Sunday: Have a hearty breakfast at the Refuge (waffles, please!) before heading out to the beach. You’ve got some options when it comes to enjoying the Atlantic ocean on our all-natural beach, including surfing lessons, wave jumping, boogie boarding, beach volleyball, ocean kayaking, or swimming out to the narrow band of shallow water past the breakers. For all of these options, we recommend bringing your own delicious lunch from Sea Star on Maddox Boulevard. Spend all day on the beach, and at 5pm, look to the southwest for a rocket launch from NASA’s Mid-Atlantic Regional Spaceport on nearby Wallops Island. In Summer 2013, some of the rockets launched from Wallops include the LADEE, which will go to the moon to conduct experiments on lunar dust, and the Antares series of ships which will resupply the International Space Station. Have a casual all-you-can-eat dinner of steamed crabs at Steamers, and head back to the Refuge for an evening dip in the half-inside, half-outside pool. Monday: Dress “Chincoteague Style” in old clothes & shoes—today you’re going to get DIRTY! Start the day off with a Marsh Mysteries workshop at the Marine Science Consortium just off the island. A favorite part of this workshop is getting “fully immersed” in the marsh ecosystem. (That’s code for really, REALLY muddy.) Workshops usually run until 12:30, just in time to grab some delicious steamed shrimp or fresh fish at Ray’s Shanty. Then head back to Chincoteague for a Back Bay Cruise with Captain Barry. Dig up some clams, learn how to hold a crab without getting pinched, and see Chincoteague “Indiana Jones Style” as the Captain calls it. Cool off from a long day in the sun at the Island Creamery, with a fresh waffle cone and hand-made ice cream that will knock your socks off. You’ll want a good shower, a few minutes of rest, and fresh change of clothes, and then head out for an upscale dinner at Bill’s Prime Seafood & Steaks on Main Street for the best broiled crabcakes and raw oysters you’ve ever had. They also have a top-notch wine selection for the adults, and super-tasty Shirley Temples for the kids. Don’t skip dessert! Carrot Cake, Crème Brulee, and Bumbleberry Pie a la mode are some local favorites and are all big enough to share. After dinner, head to Refuge Golf & Amusements for a stop at the arcade, a lap or two on the go-karts, a game of putt-putt, and (if you’re feeling up to it!) a shot at climbing the rock wall. Tuesday: Wake up knowing that you’ve scheduled one last adventure to get in the adrenaline rush that will get you through the car or plane trip home. Eat some French toast, pack up your bags, and pay one last visit to the ponies in the pasture next door. For your last adventure, head over to Eastern Shore Hang Gliding. Experience the world and the Eastern Shore from above as your heart pounds and you hang on for dear life during your tandem hang-glide. Wave goodbye to heaven-on-earth, Chincoteague Island, as you slowly descend back to earth and prepare to drive back to the hum-drum reality of the rest of the country. Pick up a pint of oysters packed for the road from Susan’s Seafood, and then head north or south on Route 13. Leaving is always bittersweet, but once you hit the highway, whoever isn’t driving should Re-Tweet or share this blog post, and let everyone know that Chincoteague Island, Virginia is for lovers of Adventure.